You could conclude that the world’s traditional pay TV service business is circling the drain if you only measure the North American market. And you would be wrong. After all, if language, food and social customs vary around the world, why wouldn’t media consumption habits? The narrative that popular internet streaming video services are crashing the party is true, but to different degrees depending on geography. In North America where, traditional pay TV subscription levels are high, down is the only direction to go whether there’s new competition, an economic recession, or a desire for less screen time. Depending upon the source of the data point, North American traditional pay TV subscriptions are now about 80% of TV households. It used to be higher before the loss of about 7 million subscribers from 2012 to 2017. This year has been no better with more than 1 million subscription losses to date. Traditional pay TV subscription penetration in other locales? Latin America (≈ 45%-55%); South Korea (≈ 95%); U.K. (≈ 58%); Spain (≈40%). Although there has been some erosion of pay TV subs in most of these countries, they pale in comparison to the losses in the U.S. and have not strayed significantly from their recent historical levels. In China, India and other emerging markets, subscriptions are growing. Level of pay TV saturation is one already noted factor in these vast differences. What are some others? Traditional pay TV subscription costs. Many factors go into pricing – what the market will bear, cost of programming, how programming is bundled; and margins. These depend on multiple factors such as competition, quality of over the air (OTA) services, broadband uptake and speed, and regulation. Where traditional pay TV costs are high and there is new lower-cost competition (i.e., in U.S.), subscription losses are greater. All the studies about cord cutters/shavers/nevers in the U.S. draw one conclusion: Cost is the number one reason for cancelling subscriptions. Another “cost” factor has to do with piracy. As it becomes easier to consume illicit TV services, the incentive to pay a legitimate service provider for certain programming diminishes. “Work arounds” for watching otherwise costly football matches in Europe and other parts are also eating into the pay TV pie. Rates of OTA and free-to-air (FTA) TV households. The use of free OTA TV services varies dramatically across the world (below) as does the ability or desire to pay for TV services. 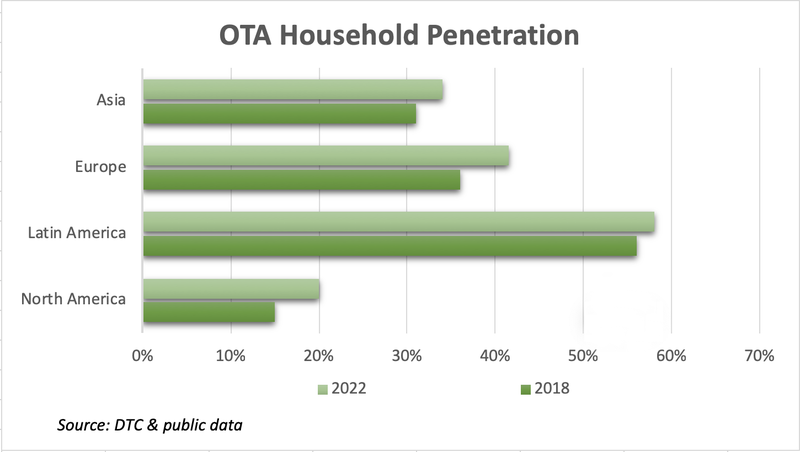 DTC’s analysis and forecast of OTA households around the world suggests that those regions with the smaller percentage of households receiving TV over the air, (Note: Some also have traditional pay TV subscriptions) will realize the biggest gains in OTA TV use, such as in North America and Europe. Those leaving the traditional pay TV fold are paying for TV services from streaming video providers, but a growing number of them are also receiving OTA TV. The introduction of digital terrestrial TV (DTT) 20 years ago offered consumers more viewing choices than did the antecedent analog service and have had varying degrees of success depending on locale (Note: Millions of people around the world still view analog TV). Whether the additional programming made content more appealing can be debated from region to region. Also, FTA direct-to-home (DTH) satellite services are popular in many parts of the world. Many are “freemium” services in which some viewers upgrade to pay service. Next-generation DTT platforms that promise a richer (for viewers) and more efficient (for broadcasters) way to transmit and view TV have an opportunity to take advantage of slowing traditional pay TV rates in certain regions. How they will take advantage of the opportunity in this swirl of new, old and transforming ways of TV viewing remains to be seen. But judging from uptake of DVB-T2 with HEVC encoding (in Europe) and ATSC 3.0 (in South Korea and soon in U.S.), OTA broadcasters do see an opportunity.